DAFI energy saving water heaters are used in North America, Australia, Japan and Eastern Europe and are now available in South Africa. 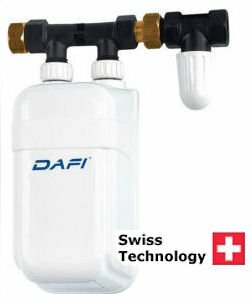 DAFI is small in size, but has all the technical parameters of expensive-to-run, traditional water heaters. Heating water is not influenced by DAFI's compact size, because the power of the heating element influences the efficiency of producing hot water. Hot water is produced instantly, as this compact heating system is installed close to each point of use. 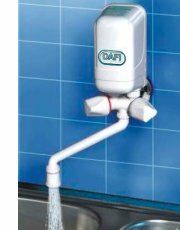 The DAFI energy saving water heater can be installed above (with spout) or under washbasins, sinks, next to baths and shower cubicles. 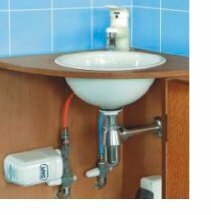 Under basin installation can be at any 360 degree angle to suit space. DAFI energy saving water heaters can also be used in conjunction with solar heating. Your DAFI energy saving instantaneous water heater is designed to be low on maintenance without corrodible metal - only durable, certified plastic is used. The heater is guaranteed by the manufacturer for 24 months from date of purchase, if installed correctly - plumber certification is needed. The variety of power strengths available in the DAFI energy saving water heater range enable better adjustment of the heater to its purpose. Eko-Dafi water filters improve drinking water quality very effectively. Installation next to water intake points will eliminate impurities from your water supply. The lifespan of the filters depend upon the quality of your water supply and the level of water purification needed.